When creating a combat encounter, let your imagination run wild and build something your players will enjoy. Once you have the details figured out, use this section to adjust the difficulty of the encounter. There are four categories of encounter difficulty. Easy. An easy encounter doesn’t tax the characters’ resources or put them in serious peril. They might lose a few hit points, but victory is pretty much guaranteed. Medium. A medium encounter usually has one or two scary moments for the players, but the characters should emerge victorious with no casualties. One or more of them might need to use healing resources. Hard. A hard encounter could go badly for the adventurers. Weaker characters might get taken out of the fight, and there’s a slim chance that one or more characters might die. Deadly. A deadly encounter could be lethal for one or more player characters. Survival often requires good tactics and quick thinking, and the party risks defeat. Use the following method to gauge the difficulty of any combat encounter. 1. Determine XP Thresholds. First, determine the experience point (XP) thresholds for each character in the party. The XP Thresholds by Character Level table has four XP thresholds for each character level, one for each category of encounter difficulty. Use a character’s level to determine his or her XP thresholds. Repeat this process for every character in the party. 2. Determine the Party’s XP Threshold. For each category of encounter difficulty, add up the characters’ XP thresholds. This determines the party’s XP threshold. You’ll end up with four totals, one for each category of encounter difficulty. Record the totals, because you can use them for every encounter in your adventure. 3. Total the Monsters’ XP. Add up the XP for all of the monsters in the encounter. Every monster has an XP value in its stat block. 4. Modify Total XP for Multiple Monsters. If the encounter includes more than one monster, apply a multiplier to the monsters’ total XP. The more monsters there are, the more attack rolls you’re making against the characters in a given round, and the more dangerous the encounter becomes. To correctly gauge an encounter’s difficulty, multiply the total XP of all the monsters in the encounter by the value given in the Encounter Multipliers table. For example, if an encounter includes four monsters worth a total of 500 XP, you would multiply the total XP of the monsters by 2, for an adjusted value of 1,000 XP. This adjusted value is not what the monsters are worth in terms of XP; the adjusted value’s only purpose is to help you accurately assess the encounter’s difficulty. When making this calculation, don’t count any monsters whose challenge rating is significantly below the average challenge rating of the other monsters in the group unless you think the weak monsters significantly contribute to the difficulty of the encounter. 5. Compare XP. Compare the monsters’ adjusted XP value to the party’s XP thresholds. The closest threshold that is lower than the adjusted XP value of the monsters determines the encounter’s difficulty. For example, an encounter with one bugbear and three hobgoblins has an adjusted XP value of 1,000, making it a hard encounter for a party of three 3rd-level characters and one 2nd-level character (which has a hard encounter threshold of 825 XP and a deadly encounter threshold of 1,400 XP). When putting together an encounter or adventure, especially at lower levels, exercise caution when using monsters whose challenge rating is higher than the party’s average level. Such a creature might deal enough damage with a single action to take out adventurers of a lower level. For example, an ogre has a challenge rating of 2, but it can kill a 1st-level wizard with a single blow. The preceding guidelines assume that you have a party consisting of three to five adventurers. If the party contains fewer than three characters, apply the next highest multiplier on the Encounter Multipliers table. For example, apply a multiplier of 1.5 when the characters fight a single monster, and a multiplier of 5 for groups of fifteen or more monsters. If the party contains six or more characters, use the next lowest multiplier on the table. Use a multiplier of 0.5 for a single monster. Sometimes an encounter features multiple enemies that the party doesn’t face all at once. For example, monsters might come at the party in waves. For such encounters, treat each discrete part or wave as a separate encounter for the purpose of determining its difficulty. A party can’t benefit from a short rest between parts of a multipart encounter, so they won’t be able to spend Hit Dice to regain hit points or recover any abilities that require a short rest to regain. As a rule, if the adjusted XP value for the monsters in a multipart encounter is higher than one-third of the party’s expected XP total for the adventuring day (see “The Adventuring Day,” below), the encounter is going to be tougher than the sum of its parts. You can build an encounter if you know its desired difficulty. The party’s XP thresholds give you an XP budget that you can spend on monsters to build easy, medium, hard, and deadly encounters. Just remember that groups of monsters eat up more of that budget than their base XP values would indicate (see step 4). For example, using the party from step 2, you can build a medium encounter by making sure that the adjusted XP value of the monsters is at least 550 XP (the party’s threshold for a medium encounter) and no more than 825 XP (the party’s threshold for a hard encounter). A single monster of challenge rating 3 (such as a manticore or owlbear) is worth 700 XP, so that’s one possibility. If you want a pair of monsters, each one will count for 1.5 times its base XP value. A pair of dire wolves (worth 200 XP each) have an adjusted XP value of 600, making them a medium encounter for the party as well. To assist with this approach, the Monster Manual presents a list of all monsters organized by challenge rating. 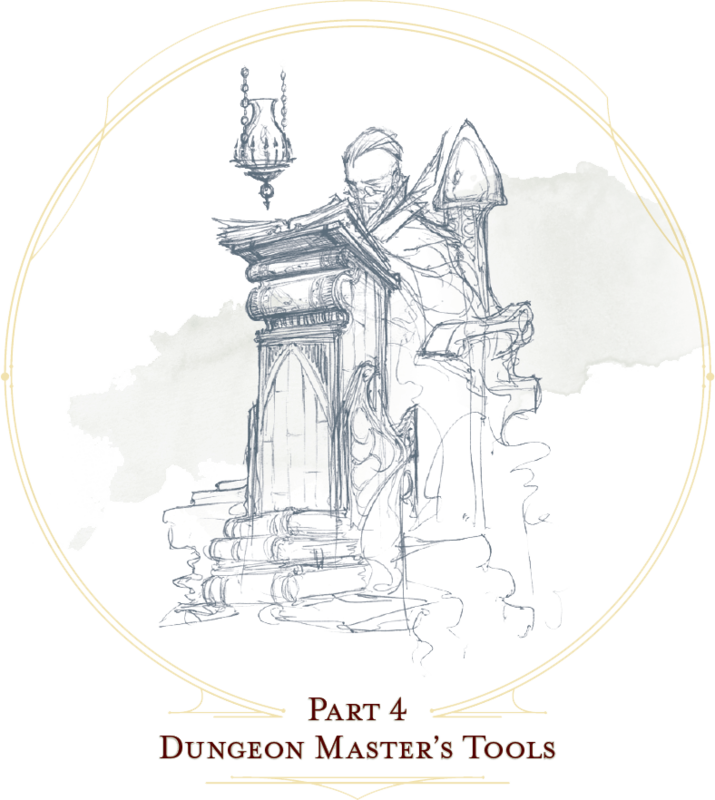 Assuming typical adventuring conditions and average luck, most adventuring parties can handle about six to eight medium or hard encounters in a day. If the adventure has more easy encounters, the adventurers can get through more. If it has more deadly encounters, they can handle fewer. In the same way you figure out the difficulty of an encounter, you can use the XP values of monsters and other opponents in an adventure as a guideline for how far the party is likely to progress. For each character in the party, use the Adventuring Day XP table to estimate how much XP that character is expected to earn in a day. Add together the values of all party members to get a total for the party’s adventuring day. This provides a rough estimate of the adjusted XP value for encounters the party can handle before the characters will need to take a long rest. In general, over the course of a full adventuring day, the party will likely need to take two short rests, about one-third and two-thirds of the way through the day. An encounter can be made easier or harder based on the choice of location and the situation. Increase the difficulty of the encounter by one step (from easy to medium, for example) if the characters have a drawback that their enemies don’t. Reduce the difficulty by one step if the characters have a benefit that their enemies don’t. Any additional benefit or drawback pushes the encounter one step in the appropriate direction. If the characters have both a benefit and a drawback, the two cancel each other out. The whole party is surprised, and the enemy isn’t. The enemy has cover, and the party doesn’t. The characters are unable to see the enemy. The characters are taking damage every round from some environmental effect or magical source, and the enemy isn’t. The characters are hanging from a rope, in the midst of scaling a sheer wall or cliff, stuck to the floor, or otherwise in a situation that greatly hinders their mobility or makes them sitting ducks. Situational benefits are similar to drawbacks except that they benefit the characters instead of the enemy.